A question that one might ask me (a minimalist when it comes to preparation) is how do you prepare entire Brain Lasher city in full knowledge that your players may take one look at it and run very far away? Indeed, it is a question I have been asking myself. My solution (besides answering some broad questions): draw a sketch of what the party might see looking at the city from a distance and hand it to my players. They had freed one of the Mongrel Man slaves who, though unwilling to accompany the party into the city, was perfectly happy to answer any questions the party might have about what they were looking at. What ensued turned into an hour-long conversation/planning session. Every spell, scroll, potion, wand and one-shot device was put on the table. They brain-stormed attacks, entry routes, escape routes, rallying points, distractions and goals. As the planning proceeded, there was a very dangerous look that I recognized in the eyes of my players — a look that said, “This could work.” By the time they were ready to act, even players who had started the evening trying to convince everybody to retreat were on board with the plan and ready to play their part. The focal point of the plan was a tower that stood grotesquely at the center of the city. It seemed biological in nature, with four feet that twisted around each other into a support for four vein-laced globes. At its base was the portal that the party was interested in finding. This, in turn, was surrounded my miles of machinery maintained by the mongrel men slaves. The feet of the tower pulsed as the energy produced by the machines and the portal flowed upward toward the globes. This giant biological machine was both where the majority of the Brain Lashers lived and where they refined that energy into pure azoth. The party figured that if they could take out one or two of the leg supports of the tower, the whole thing could come crashing down. Depending on how the denizens reacted, they had several options on what they could do in the chaos. But first, they created a distraction by getting the resident flailsnails to stampede (as much as flailsnails do stampede). Using a cocktail of spells and potions, they set charges with any and every combustible devise/substance that they owned and fired several spells into the charges to get them to go off. The flailsnails slowed down the reaction time of the natives which allowed the party to continue guerrilla attacks against a group of Brain Lashers who were pooling their powers to try and prevent the tower from falling. This state of confusion did not last long, however, and the party soon found themselves surrounded by Brain Lashers and some of their demonic minions. The party was in no position to retreat anywhere but through the portal; however, in their final push to escape, the Brain Lashers tasked with keeping up the tower were so decimated that the tower came crashing down just as the last of the party dived through the portal. Surprisingly, despite the desperate situation, only one corpse needed to make the trip — Ahkmed’s henchmen Kavella the Elf. The rest were beaten and bloodied, but alive. The destruction that followed destroyed an entire section of the city, including a good amount of the machines designed to keep the portal stable. Thus, the party had effectively cut off pursuit. Of course, they were now trapped on the other side, which is where our session ended. Gleefully taking my own advice, one of the many ideas I have stolen from James’ Dwimmermount campaign is azoth, known to my players as liquid magic. As I have worked this week to prepare a Brain Lasher city, azoth and its origin in quintessence have played a very large role. The first question that I asked of myself when detailing the city was: to what purpose was this city built? What was the reason Brain Lashers wanted to live here en masse? (Thus, despite the weirdness of the environment, my own tendency toward Gygaxian naturalism rears its head). The answer: azoth. Unlike in Dwimmermount, where azoth mysteriously rained down on various planets at some point in the past, the existence of azoth in my campaign is quite deliberate. The Brain Lashers “mine” it from various suitable dimensions. It is a very laborious and slow process, but, given the powerful qualities of the end product, (especially since it is almost entirely accomplished by slave labor) they see it as quite worth their while. I am also putting a subtle Christian spin on the story. Since Brain Lashers have a visage not unlike Cthulhu it should come as no surprise that they (knowingly or unknowingly) serve the demonic outer gods. Thus, their efforts to mine azoth from the quintessence has the negative consequence of literally tearing holes in creation — thus speeding it on its way back to the nothing from whence it came (a little Christian dogma, there). These holes are the myriad portals my players have found in various parts of my campaign world (though they have yet to voluntarily step through one). Thus, the portal that the party expects to find in the city is actually the very place the Brain Lashers are mining azoth. Today is the Feast of St. Alypius the Stylite — where the title Stylite refers to that wonderfully strange monastic practice of living life atop a pillar. His mother was a Christian and was widowed early in the life of her son. Therefore, she sent him to be educated by the Bishop Theodore. She then gave all that she owned to the poor, took up the ascetic life and became a deaconess. As an aside, this is why and how I can justify female cleric characters in my games. Though the deaconess was required to be celibate (or widowed, as in the case of Alypius' mother) and older (40 years old), women were ordained in the ancient church. They primarily served in monasteries and ministered to women and girls, especially during sacraments that required physical contact like baptism — it was seen as inappropriate for male priests and bishops to physically handle women. Historically, the ordination of the deaconess largely fell out of practice around the 9th century, though there are still pockets where the practice still exists. While he was traveling with the bishop to Constantinople, St. Alypius received a vision from St. Euphemia to build a church dedicated to her in the pace of his birth, the city of Adrianopolis. Once he had raised enough funds, he set about building the church on the site of a dilapidated pagan temple. The site was infested by devils. Having had the desire to lead an ascetic life since his youth, Alypius erected a pillar on top of a pagan tomb next where the church was to be built. There, he battled the devils on a nightly basis. Their favorite attack was to pelt him with stones. He was finally able to drive them away when he had all the protections of his small shelter removed and he was completely exposed to the elements. St. Alypius remained upon his pillar for fifty-three years. Two monasteries were built at the site during his lifetime — one for men and one for women. He reposed at the age of 118 in the year A.D. 640. His relics remain in the church he built in honor of St. Euphemia. Besides the various Christian artifacts that can be found in the early editions of D&D, it is stories like those of St. Alypius that make me entirely comfortable with the idea that D&D is compatible with Christianity. His story reads like the character arc of a typical D&D cleric. He is apprenticed to a bishop (levels 1 to 3). He then heads off on his own adventure — that wonderful trope of the temple ruins (levels 4-6). He battles the denizens of this location based adventure and finally emerges victorious (levels 7-9). Having collected enough funds, he builds a church and begins to attract followers (the two monasteries). As I have said before (and I am sure I will say again), the idea of the stylite is marvelously bizarre. It is a great way to add flavor to a fantasy setting — and I love the fact that it comes from an established Christian practice. These structures appear in various forms, but are always columnar with enough space on the top for a single person to stand or sit. They are almost always found in remote wilderness and radiate of magic when detected for. This magic manifests when someone tries to spend the night praying atop the pillar. When attempting to do so, a wandering monster check should be made every hour, with a minimum of one wandering monster encounter for the night. These encounters do not result in the loss either of sleep or the gaining of spells. The effects of a Bless spell for 24 hours. The ability to Turn Undead at one level higher for 24 hours. An extra spell (to be determined by the Referee). Stylite Pillars cannot be moved. This was a very unusual session. Normally, while there is a fare share of player & character interaction, discussion about what to do and conversation with NPCs, a majority of time is spent exploring, fighting monsters, dealing with traps, hauling home treasure and figuring out how best to spend that treasure. In contrast, this session was almost entirely a huge role-play discussion about what to do next. While there was some concern from some players about the fact that not much happened over the course of the evening, I had to admit that I had a lot of fun. The evening began with trying to figure out how to get someone hooked up to the pilot's seat of the Brain Lasher ship. The cockpit had what looked like a crown with umbilical cords attached to the flesh-like interior of the ship. Gilek the Gnome (who has turned out to be a bit of a daredevil) tried first, with disastrous effects (a horrendously failed saving throw resulted in INT loss). This put fear in several of the other players until one of the newer guys figured he had nothing to lose, because he hadn't even figured out the name of his character yet (YES! old school character creation in action!). Being a magic-user, Dimiter (earning a name after accomplishing something a long-standing character could not), his INT score held up to the mental onslaught of the ship sending mental tendrils into his cortex. Thus began what, in essence, was a session-long discussion. I had fun playing up the ship as an alien intelligence. I answered questions with monosyllabic answers whenever possible and when I couldn't, I tried to answer with another question. It was fun seeing the party try and plan how to get around the logic of the ship. The crux of the issue was that the party needed a key and some food in order to be able to even think about getting home. On the body of the Brain Lasher, the party had found a gem with what we would describe as a laser etching of a trident on the interior of the stone. They figured they had the key. So they set about getting some food. On the horizon was what looked to be several islands to what the party designated south-east and a larger land mass on the horizon to the north. They decided to head to the islands where they found some plant-life with brain sacks half-buried under the sand at the base of the simple root system. Much hilarity ensued as Gilek insisted on experimenting with the plants prior to taking them back to the ship (where anything disastrous might destroy the ship). In short, many a save vs. poison roll failed with non-deadly but funny results. Eventually, the gnome was unconscious on the sand and the rest of the party was satisfied that the plants were safe enough. Though not ideal and certainly not as nutritious as a sentient being, the ship admitted that the plants were "palatable." Having thus secured what they believed to be the key and a food source, the discussion turned to what to do next. This is when all chaos broke out in what ended up being a huge discussion where players struggled with what they wanted to do, what they thought their characters wanted to do and what they thought the party should do. Ahkmed had some time ago procured a manual about strange machines written in the same language used by the Yellow Faces. While preparations for getting food were underway he had managed to decipher enough of it that he knew he wanted some exotic metals to start experimenting with. The party noticed that the trident etched inside the key matched a trident on a icosahedron map that the party had acquired ages ago, but had not pursued. The ship informed them that the map probably lead to the city where the Yellow Faces (referred to by the ship as Cyn) came from. The ship also informed the party that there was a Brain Lasher city a few days travel inland on the larger landmass. The party determined that the Cyn who was on the ship when they were attacked is from a group that is currently allied with the Brain Lashers and at war with other types of Cyn. The sentiment of the group was how often do we get to go adventure in a Brain Lasher city? So, albeit reluctantly, the group set foot on the larger landmass to head inland. Within a day, they ran into a patrol of mongrel men mounted upon flailsnails. Initially, the party wanted to avoid any contact (and having surprise, they could have); however, Gilek noticed that the mongrel men had something attached to the back of their neck. Figuring that this was some kind of mind-control device, he attacked in hopes of freeing one or more of them to gain more information. Only one mongrel man survived the combat and the removal of the device (which was organic and tentacled — some of which were wrapped around the base of the brain). Though confused and terrified, the party did manage to get information about the city itself. Part of the population were Cyn. Travel to and from the city mainly occurred via an inter-dimensional portal somewhere in the city. The majority of the population were slaves, controlled by the same device as the mongrel men. A good number of players were interested in at least scouting out the city in hopes of being able to find a way of inciting a slave revolt to disguise their attempts to either take out as many Cyn as possible or finding the portal. There were also a number of players who wanted to retreat back to the ship and try to get home that way. Today is the feast day of the Prophet Obadiah, who gives us one of the shortest books in all of Scripture (it is only 21 verses). As such, there is very little textual evidence to nail down which of the dozen or so men named Obadiah in Scripture he might be. The most popular attribution, though, is the Obadiah mentioned in the eighteenth chapter of 1 Kings (or 3 Kings if you prefer the LXX reckoning). He was Master of the Palace in the court of Ahab. Though the king had turned away from God, Obadiah secretly remained faithful. During the persecution of the prophets by Ahab's queen, Jezebel, Obadiah hid one hundred of them away in a cave (fifty at a time) to shelter, protect and feed them. It was Obadiah that announced the presence of Elijah to Ahab in prelude to one of my favorite stories from the OT: Elijah vs. the priests of Baal on Mt. Carmel. For those who claim to prefer the pulpiness of S&S, I only ask that you re-read (read for the first time?) 1 Kings 18. Though it is a different genre than the writings of REH, HPL, CAS etc., it does call to mind the conflict between the followers of Mitra and the devotees of Set one might find in a tale about everyone's favorite Cimmerian. It doesn't take a lot of imagination to extrapolate this story into the basis for a campaign. There is a city-state with an evil king and his even more sinister queen. The nasty blood cult of Baal holds sway over most of the population. The followers of Elohim work in secret to protect their own. There are lost, antediluvian civilizations to discover and explore in addition to the tombs of such known civilizations as the Egyptians, the Babylonians and the Assyrians (all of which scream dungeon!). To boot, all three of the core classes from OD&D can be represented. The aspect I like best of this set-up is the fact that Prophets make very good Clerics. Not only does the armored holy warrior jive well with the likes of Obadiah ( who opens his prophecy with a call to arms: "Up! Let us march against this people. Into battle! "), but the spell list conforms very well with the types of miracles one finds in the OT. Even Raise Dead can be said to have used by Elijah's successor Elisha with the son of the Shunnemite woman. In other words, Obadiah doesn't just introduce Elijah to Ahab, but introduces us to a way to play a D&D campaign that cleaves closely to both Scripture and the S&S roots of the game. If I am honest, over the years I have probably spent more money on Traveller than I have on D&D — I certainly own a lot of Traveller related stuff that takes up more space on my bookshelf than my D&D books. That money, however, has never produced any kind of long-term campaign. It's not that my fiends and I didn't play Traveller (we did), it's that we had a lot more fun playing the mini-game of character and world creation than we did when we finally got around to doing something with those characters and worlds. I mention this because in my Lost Colonies campaign, there is a real possibility that my players not only will not be heading back to Headwaters any time soon, but may be hopping from one world to the next in ways that I will not be able to predict. I do have several options available to me, one of which I don't relish at all: creating from scratch all of the various possible choices my players could make. I could also assign various pre-fab campaign worlds to each of those possible choices. While I certainly have a couple in mind to have as options, I don't have enough and too many of them are not only interchangeable, but some of my players are also intimately familiar with them. Enter Judges Guild. Back in 1980 and 1981, Rudy Kraft produced his Portals series of mini-campaigns. Each has a radically different flavor than that found in a typical D&D world and they are all connected by a series of portals that teleport players in-between worlds (thus, giving them all a dungeon-like feel). The world that I find most inspiring is the world presented in Portals of Twilight. Whereas the other two installments derived their uniqueness from their inhabitants, Twilight is unique because of the world itself. The rotation of the planet is parallel to the orbit so that one side is always in light and one in darkness. Thus, the only inhabitable part of the planet in the narrow strip of twilight along the equator. This sounds like something straight out of Traveller. It is random — which usually results in more creativity on my part. It's fun — I have literally spent days of my life creating sub-sectors for use in Traveller. All the results can be recorded in a simple code wherein there will be enough information for me to be able to improvise should I need to. I don't have to waste a whole lot of time creating a bunch of worlds my players will never visit. I do this with a very real sense of irony — my very first long-term Traveller campaign has turned out to be D&D. Enslavers are a cephalopod-like semi-humanoid race originally engineered by Brain Lashers for the purpose of hunting down and capturing food. Although still found in service to their designers, they have been found to be in service to other creatures and even as independent slavers and pirates. Their spineless bodies not only allow them to fit through tiny spaces and elongate their limbs into whip-like weapons, but it allows them to "roll with the punch." As a result, they only take half-damage from all normal attacks. Cold and fire attacks do normal damage and they take double damage from electrical attacks. Although capable of using normal weapons when attacking, Enslavers prefer to attack first by elongating their limbs in whip-like fashion. A successful attack does no damage, but requires the target to save vs. spells or drop their weapon. Regardless of the success or failure of the save, the Enslaver gets a +2 on their next attack roll. This second attack normally utilizes the mass of squirming tentacles Enslavers have in place of a face. A successful attack has a similar effect as a Sleep spell (no save). This attack is not magical in nature and therefore can affect elves. I have to admit, I had a lot of fun this session because one of the things I enjoy most is watching players react to circumstances and this session saw a lot of really great reactions. After doing some last minute purchases and other house keeping, the party secured the services of a sailing ship to take them down the coast to the elf lands. They never got there. In preparation for the evening's fun, I had pre-rolled random encounters and this is where I have to admit that I do not always strictly follow random table rolls. The primary reason I like to use random tables is that they challenge me to be creative. Therefore, when I am inspired by a roll that does not necessarily strictly adhere to the result I will run with it. Moon things have an affinity for the sea, and are sailors, pirates, and slavers. They capture humans to sell as slaves in faraway lands and on other planets. Therefore, this became the basis for what appeared on the horizon as the players lazily sailed south (even though Hamlen had bought some pipes and was annoying everyone as he tried, and failed, to become a competent musician. Using his spyglass, Dn. Swibish caught a glimpse of a shadowed outline within what appeared to be a storm cloud. Given that the rest of the party has often accused the deacon from Redwraith of exaggeration, his warnings went unheeded until it was too late. A fast moving galley sporting a tentacled ram slammed into the side of their ship and engaged boarding ramps. The subsequent battle did not go well for the moon things. Despite managing to flank the party, incapacitating and even capturing several party members and crew, the moon things were made mince meat. The party made good use of spells, missile weapons from the crow's nest and coordinated attacks. However, the moon things were not alone. They were being lead by another Yellow Face, this one apparently with mental powers able to do damage by just thinking about it (literally). Therefore, despite the relative success against the moon things, the party very quickly had to concentrate fire on Yellow Face in order to neutralize him as soon as possible. This gave the haggard moon things the chance to get away with prisoners. The pirate galley began to pull away from the party's ship with captives in tow, so the party went on the offensive. This is when things started to go south for the party. Coleman and Raine (two of the newer characters) failed to cleanly jump across, which resulted in their capture. Getting rid of Yellow Face also proved much more difficult than anticipated (despite a successful Hold spell). This capture and delay allowed the pirates enough time to start up their engines, create an energy field and hop into a different dimension. This encouraged the party to rush below deck where they found their captive party members and crew plugged into a large magical/biological engine, having replaced several desiccated and emaciated corpses on the floor. Unfortunately for the party, some of this vision was a mental illusion and when they went to rescue their companions, they instead found themselves in range of the melee attack of a Brain Lasher. This reveal, by the way, produced one of the truly great reactions of the campaign so far. I have been hinting throughout the campaign that Brain Lashers are lurking behind the scenes, but this is the first time the party came face to face with one. Dn. Goram has been voicing fear of ever encountering one ever since the very first cthuloid visage showed up in the campaign. Upon actually seeing one, his player (and therefore Dn. Goram) completely freaked out. It all came down to one initiative roll. Dn. Swibish was in the grip of the Brain Lasher and his brain was poised to be sucked out of his skull. Had the party lost initiative, he would have died. While he was beating the Brain Lasher corpse into pulp (to make sure it was dead-dead), the rest of the party was busy exploring those things that the illusion had hidden. They found their captured party members alive, but minus several INT points (brain damage from being plugged into the machine). There was a wonderful aha! moment when the party put the pieces together and correctly surmised that the Brain Lasher had raided their vessel in order to refuel. The main part of the vessel disguised by the illusion was the cockpit, wherein controls seemed to be hooked up to the cranium of the pilot. There was also a large dial covered in an unknown writing. The session ended with the party realizing that they had to somehow figure out how to power and pilot this vehicle if they wished to get home. As Theodoric pointed out yesterday, most of the world commemorates St. Martin of Tours on November 11th; however, there are pockets where his feast is kept on the 12th — which is where he appears on the Greek calendar. Therefore, those of us who like him have an excuse for celebrating two days in a row. St. Martin was a 4th century bishop born to pagan parents. He became a catechumen (someone studying to become a Christian) at a young age. Baptized at the age of 22, he went on to become a monastic in Gaul before taking on the mantel of a bishop. One of the most famous stories of St. Martin comes from when he was still a catechumen. He was serving in the Roman army when he saw an ill-clad beggar asking for alms. With nothing but the clothes on his back to give, the saint tore his military cloak in two and gave half to the beggar. Later that night, Jesus Christ Himself appeared to Martin, clothed in the cloak he had given the beggar. This cloak was then kept as a relic in a sanctuary. In latin, the word cloak is cappella which is what the sanctuary came to be called. Those who took care of the sanctuary came to be called cappellani. In English, these two words form the basis from which we get the words chapel and chaplain. Besides my own personal love and interest in St. Martin, I was also very eager to delve into his life because he informs by own understanding of Averoigne. Though Tours is outside the traditional boundaries of where Averoigne is thought to be, St. Martin nonetheless casts a very large shadow over Gaul and even over all of Western Christendom. He was instrumental in sowing the seeds that would blossom into the Western monastic tradition. Therefore, St. Martin is a figure I very much want to bring into the tapestry that is my version of Averoigne. One easy way to do this is to simply have his cappella as a clerical magical artifact in the campaign. Indeed, there are plenty of examples of relics of saints that are pieces of clothing. I personally have seen shoes and strips of cloth used as foci for prayer and indeed a source of healing. Therefore, there are a plethora of opportunities to place unique magic items within a campaign world. This disheveled and apparently misused cloak has been torn in two and sown back together again; however, it radiates of magic if a Detect Magic spell is cast upon it. It is wearable by anyone, and its affects depend upon wearer's Wisdom score. For those that have a penalty due to a low Wisdom, the cloak serves as a Cloak of Protection. The protection bonus is the inverse score of the Wisdom penalty. Thus, for someone with a Wisdom score of 3 (which has a penalty of -3), the cloak would have a bonus of +3. For those who have a Wisdom bonus, the cloak grants bonus cleric spells: one 1st level if the bonus is +1, one 2nd level if the bonus is +2 and one 3rd level if the bonus is +3. These spells are cumulative (a Wisdom score of 18 would grant 3 spells — one each: 1st, 2nd and 3rd) and are in addition to any other bonus spells a cleric may already receive for a high Wisdom. These bonus spells are granted to anyone regardless of class and are determined randomly. The spells stay until they are used in a creative/productive manner (no casting a utility spell like Water Breathing just to get rid of it). For those who have no Wisdom Bonus, the cloak allows an Augury spell to be cast once per day. Just a quick note: I have had a very busy week with a combination of travel out of town and family in town. So, it has been relatively quiet around here; however, I did want to share a thought that occurred to me after reading James' post on the Astral Plane. I have long been fascinated by the possibility of planar travel in D&D. The closest I have ever come to it in play, however, was a semi-Monte Haul campaign I played when I was (much) younger. It pitted my paladin against the likes of Githyanki and their ilk. While I did have fun playing in that campaign, I have never bothered to run one similar myself because, like James, I found all the specific fiddly bits surrounding planar travel to be unwieldy and discouraging. This has always been a disappointment because I have always liked the idea (one of the only reasons why I look back on the paladin vs. Githyanki campaign with any fondness at all). I have therefore been contemplating simple ways to indicate that players are no longer in Kansas anymore. One of the more interesting experiments I ran during my Lost Colonies campaign saw the players in a City of Brass-type setting. In order to clue the players into the fact that this was abnormal, we used a combat system similar to that of Chainmail rather than D&D. In other words, simple (and universal) mechanics can go a long way to achieving the feel of planar travel. One of the more compelling ideas I had this week (particularly for the Astral plane) was to switch around the affects of characteristic bonuses. Thus, the three physical abilities (Str, Dex and Con) would effectively function as Int, Wis and Cha and vice versa. Thus, that 18 Str fighter with a 3 Int would suddenly be fighting at a -3 rather than a +3. Mechanically, this simply implies that physical tasks in the Astral Plane are rather tasks of the intellect and will and that intellectual matters are more akin to a physical self-awareness. What other simple mechanical changes could represent other planes? This last session was primarily about logistics. The party wanted to get back to Headwaters in order to be reunited with Hamlen and Grak in addition to taking care of some unfinished business (mainly, retrieving a dragon's hoard that they had not been able to haul out of the dungeon in the wake of the near TPK when confronting said dragon). It also saw the introduction of several new players (including a father/son combo). So we had to set aside some time to trying to introduce folks to the system and allow them to roll up characters. The center piece of the evening was a three-way battle for the dragon hoard. A tribe of bugbears had discovered the dragon lair and were in process of claiming it as their own when a bulette showed up looking for a meal (I love random encounter tables). The battle was such that some of the higher level characters could wade into the midst of the melee while the lower level characters were able to be tactically significant by raining down missile fire at areas not currently occupied by party members (never underestimate the value of concentrated missile fire — it can be devastating). Hamlen contracted workers to start building a dojo-like sword fighting school. Ahkmed began excavation for his underground home. Dn. Goram got some monastics to start on the elvish illuminated text of Scripture. Several party members pooled resources to hire workers to repair the bridge destroyed several sessions ago by a possessed cloud giant. These last two happened in the environs of the main human city in my campaign, Trisagia. The party set about getting several pieces of equipment unavailable in Headwaters and then hired a ship to take them back to the elf lands. It seems as if they are interested in playing politics…we'll see. I forget where, but someone in the blogosphere wondered what would happen to a local economy if a party of adventurers started throwing around bunch of gold. Would there be a lot of inflation? Would it destroy the local economy? etc. If a lot of money were being poured into the same products in the same economic space, this would increase demand and therefore result in a price hike. My players, however, have been careful how they have spent their money. They have spread out their purchases across a broad landscape, both physically and economically. As a result, they have attracted workers, created jobs and encouraged economic growth. They have started businesses (a cheese factory, a winery and a tavern). They have created new opportunities for NPCs and workers (by continuing to have building projects). The bridge that is being repaired is being fixed in order to restore the flow of trade between Trisagia and Headwaters. All in all, the only impact my players have had on the economy, that I can justify, is a positive one. Headwaters is growing because of it. Today is one of two recognized feast days for St. Raphael of Brooklyn, one of the most recently recognized Orthodox Christian saints (glorified in 2000). These two feast days are February 27 and the first Saturday of November (which places it shortly prior to Raphael's own patronal feast for the Archangels on November 8). St. Raphael was born Rafla Hawaweeny in Beirut, Lebanon in 1860 where his parents had fled from Damascus in Syria due to religious persecution. In 1879 he was tonsured a monk. After receiving a theological education at the Theological School at Halki (in Turkey — which, by the way, has been shut down by Turkish authorities since 1971) where he was ordained to the deaconate in 1885. He then went to study at the Theological Academy in Kiev where he was ordained a priest in 1889. He was then invited to New York to become the pastor of the city's Syro-Arab Orthodox Christian community (which would later move to Brooklyn). He arrived in New York in November of 1895. He would spent the rest of his life traveling the U.S. seeking out Orthodox Arabs to minister to them, and to gather them together. Before his death in 1915 he had established 30 parishes and had gathered together around 25,000 faithful. He was also involved in founding St. Tikhon's Orthodox Monastery (which is also now a seminary). 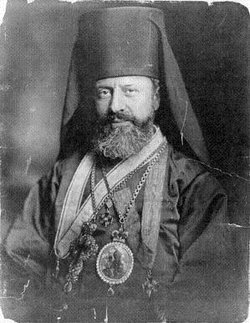 In 1904 he was the first Orthodox Christian bishop ordained in North America. Although St. Raphael is a fantastic example of the kind of wandering cleric one might expect in a D&D campaign (and even demonstrates how, in extreme situations, priests and bishops will wander far and wide), I am going to indulge in a little Gamer ADD. Given the relative modernity of St. Raphael, he provides a marvelous model for the wandering holy man in a wide range of setting and genre-based games. Let me preface this by reminding folks that today Orthodox Christianity uses a version of the Divine Liturgy that was redacted by St. John Chrysostom in the 4th century using a version even earlier than that. Despite the radical changes that the world has gone through in the last sixteen centuries, Orthodox Christianity has stayed true to what has been passed down from generation to generation. This is not due to a reticence to change with the times, but rather out of an ability to make that which was passed down relevant to each successive age. This is my way of pointing out that sixteen centuries from now, the Orthodox Church will still be with us and most likely will still be praying the same words St. John Chrysostom wrote sixteen hundred years ago and that we pray today. Therefore, any genre that hypothesizes a world based on our own ought to have a place for a St. Raphael — a wandering Christian missionary — even if it only ever remains a potentiality. One of my pet peeves about the sci-fi genre (particularly in the last two decades or so) is that it not only ignores this potentiality, but actively tries to deny it. Despite surviving heresy and schism, Roman persecutions, Persian invasions, Muslim conquests, and Communist depravities, Christianity will somehow disappear in the face of modern science? Really? 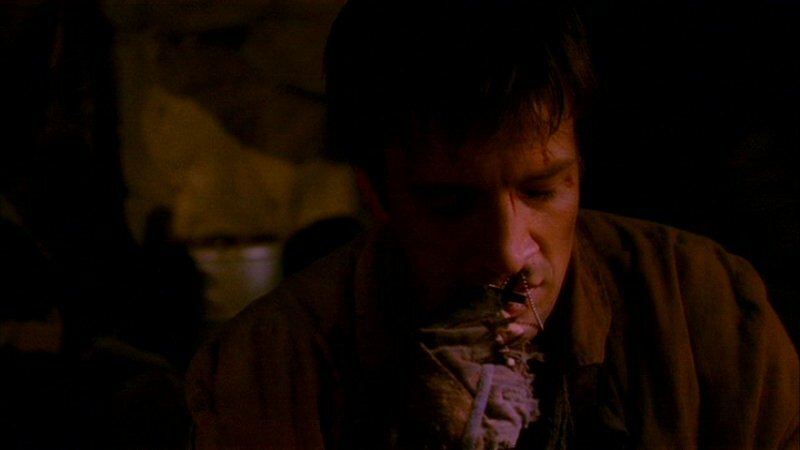 It is for this reason that one of my all-time favorites in any medium of sci-fi is Firefly/Serenity. Joss Whedon is honest enough to make Christianity and Christian characters part of his story. Indeed, Malcom Reynolds is a great simile for the modern American. Despite all his protestations to the contrary, Christianity forms the core of his principles and often explains why he makes the choices that he does. St. Raphael himself personifies an archetype appropriate for such games as Boot Hill, Deadlands and Weird West. 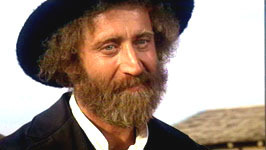 For another example from popular culture, let me highlight my favorite Gene Wilder movie, The Frisco Kid where he plays a rabbi trying to cross the country to minister to the Jewish Community in San Francisco. This archetype is easily applicable to such hard sci-fi games as Traveller, Thousand Suns and Stars Without Number. Book from Firefly/Serenity is an excellent example. Even in games that envision a world that destroyed itself (such as Gamma World), Christianity was part of that past and (through the power of the Holy Spirit) could have either survived or be part of a character's quest to recover. In other words, my love of the cleric class goes far beyond the confines of D&D and its descendants and St. Raphael is my guide. One of the things that I adore about actually playing (as opposed to just thinking about playing) is that you are forced to consider things that would never occur to you otherwise. Living inside the bubble of intellectual exercise it is easy to be a purist, where your favorite ruleset perfectly meshes with your vision of the campaign world and the way you want the game to be played. Once you give up control and allow the messiness of an actual campaign, however, the intellectual exercise makes less and less sense. As I mentioned in my last session report on Lost Colonies, some of my players have pooled a considerable amount of money in order to build a church in the elf lands — something that has never been done before. This comes on the tails of the party helping out the elves in dramatic fashion, all the while saying that their problems are better dealt with a dash of faith. A faith, by the way, that would be largely appealing to those elves of the Summer Court. Be fruitful, and multiply, and replenish the east, and subdue it; and have dominion over the fish of sea, and over the fowl of the air, and over every living thing that moves upon the earth. In Greek, the word translated as subdue has as its root kyrios, meaning lord. This is a title given to God — thus, God is commanding us to have a relationship with creation as He has. This view is reinforced when one looks at the Hebrew for the word translated as dominion. The literal meaning is to tread in a wine press. In other words, we are to be co-creators with God and we are to offer up our creative efforts to God. It is significant that verb has the visual image of the wine press — creating something that, by offering it to God, becomes the Blood of Christ. This kind of relationship with nature is right up the elves' alley. Therefore, due entirely to play, am forced to consider something I have never before allowed in any game I have ever played — an elven cleric. Looking at the rules as written (AEC/1ed), elves can advance to 7th level and half-elves to 5th level. Personally, this doesn't make much sense to me. I can understand why an elf would be less likely to advance to higher levels using divine rather than arcane magic, but why are half-elves so much worse? If being a cleric is a human thing, how is it that a half-elf would be less inclined to divine magic than an elf, who is completely alien to humanity? The AEC is more generous with potential fighter levels than 1ed. Elves can advance to 10th level (as opposed to 7th) and half-elves can go to 12th level (as opposed to 8th). I believe this discrepancy originates in the fact that the AEC operates in a system where race-as-class is an option. Therefore, going the multi-class route needs to be comparable to the race-as-class or there is no point in allowing the multi-class option in the first place. This begs the question: why shouldn't elven clerics simply be a race-as-class that casts divine magic instead of arcane magic? While I really like this approach (being partial to race-as-class), I am not particularly comfortable with the idea of elves running around like super-paladins (despite the extra XP requirements, it would be awfully tempting to go with an elf over the cleric). It also removes some of the alien-ness of elves. A more attractive option, taking a cue from Genesis 1:28, is to allow Istinite elves to cast Druid spells. This differentiates them from ordinary elves and maintains that alien-ness that I like to have with my demi-humans (especially since no one else would be casting druid spells). One aspect of this that I find particularly interesting is that this will likely sour relationships between the Summer and Winter Courts. Whereas the Winter Court is all about cheating death, a Summer Court dominated by Istinite elves would be quite comfortable with death. What had been a rather cordial relationship (because all Summer Court elves knew they would one day be members of the Winter Court) could become downright hostile. This session saw the first major battle of the campaign as the party took part in eradicating the undead horde that they unleashed upon the elf lands. Unfortunately, I am not familiar with any kind of macro-battle system that works to my liking (not that I have had any burning desire or need to look very hard) and my group wasn't very much into the idea of running a large scale battle against the ghouls. What to do? We began the session with a review of the situation for those who had missed one or more sessions. I then let the players plan, interact with NPCs, answered any questions and provided guidance as to what was available to them in terms of troops, equipment and terrain. The plan that they came up with was actually quite ingenious. Their objective was to lure the ghouls along some cliffs (a major geological feature of the area) and then pummel them from above using both elven archers and boulder-throwing cloud giants. Ground troops could then encircle to cut off escape and take care of any stragglers. In such cases, what I try to do in order to make the players feel like they had a role in the larger picture without having to resort to playing out that bigger picture is to remove one or more major pieces of their desired outcome. It is then up to the players to get those pieces back on the board. In this case, their plan relied heavily on the presence of cloud giants. Therefore, the session involved the party making sure that those giants could make it to the battle. It turned out that the reason that Yellow Face and his charmed ogres and half-giants were able to so easily overrun the castle of the cloud giant king was that there was a traitor inside and that it was grossly undermanned. When the king disappeared, he took his personal guard with him. On top of that, the traitor convinced the queen to send out search parties. By interviewing Ornak the Half-giant, the party learned that the search party going north was likely wiped out by another tribe of half-giants led by another spell casting Yellow Face. This group was most likely going to arrive at the undermanned castle prior to the undead horde. The party, therefore, had to defend the castle and find one or more of the remaining search parties in order to be able to have any cloud giants available for the final battle against the ghouls. To my players' credit, they did both with aplomb and careful planning. As a result, I ruled that the battle went off as planned, although Dn. Swibish was certain that their had been around 2000 ghouls when they unleashed the undead horde but he estimated that the battle saw the demise of only about 1800. The party assumed the missing ghouls were due to the efforts of the former Winter King, which he had promised to the Summer Court before mysteriously disappearing. I have to admit that this whetted my appetite for more larger scale battles — especially since the party is getting up in level and therefore is beginning to think in terms of building strongholds (indeed, the session ended with Dn. Goram and Dn. Swibish pooling their resources to build the first church in the elf lands and to commission an illuminated text of scripture translated into elvish). At some point I am going to want to give the party the opportunity to head up armies and not just a handful of henchman and followers. Have you ever run a big battle in your campaign? If so, what system did you use and why? How'd it work out?